I hope that you will be able to participate in the annual Ken Maddy Institute fundraiser at the California Museum, 1020 O Street in Sacramento on Monday, April 3rd from 5:30 to 7:30 pm to benefit their Capitol internship program. This is a unique and great opportunity to mingle with some of California's top political leaders - past, present and future. Governor Jerry Brown and the State's Legislative Leaders will be there too. 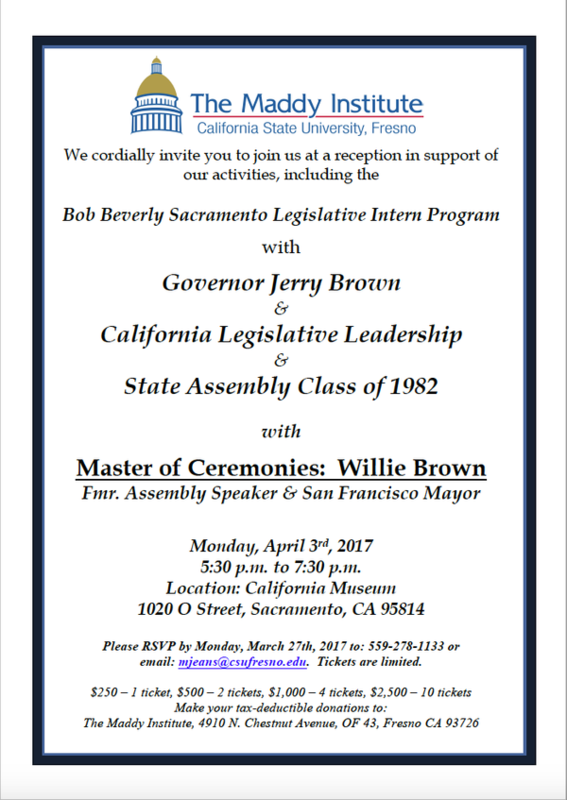 Former Speaker Willie Brown will MC the event, and I can assure you that any program with Jerry and Willie is going to be a fun night to remember. Purchase Your Ticket(s) or Sponsorship Here!